The DongFeng-16, or DF-16, is a multistage short-range ballistic missile (SRBM) and is one of China’s most advanced SRBMs. First deemed operational in September 2015, the new weapon system has achieved 11 successes out of 11 test launches and is an improvement model of the DF-11 and the DF-15. [i] The multistage, solid propellant missile possesses a range of around 1,000 km and is MIRV capable of carrying up to 3 nuclear warheads with a payload of up to 1,000kg. Deployed on a five-axle Sanjian Corporation TEL, the DF-16 is road-mobile and is launched from a vertical position. Using both inertial and GPS guidance systems, the missile is highly accurate with a CEP of 5m and capable maneuvers to avoid missile defense systems during the terminal phase. 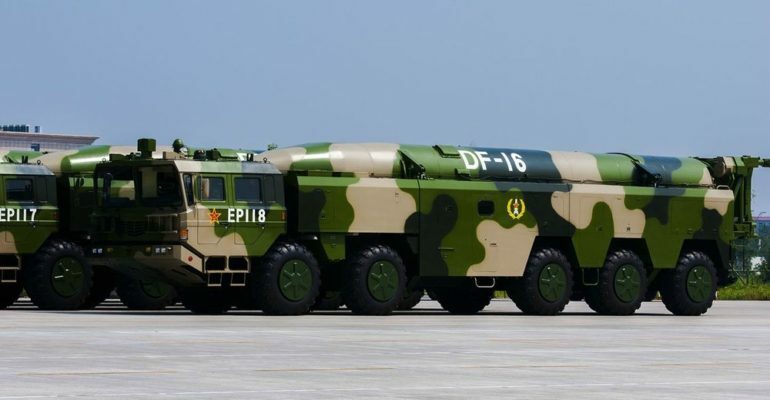 [ii] China is presently suspected to have approximately 50 operational DF-16 missiles. The SRBM was publically shown for the third time during a military exercise in China on February 6, 2017.